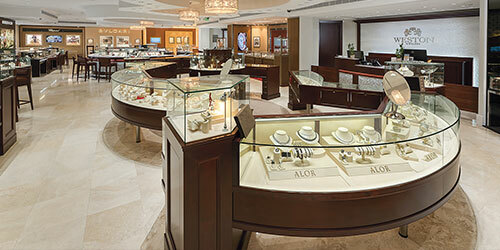 Amid the small-town ambience of Weston Town Center sits one of the country’s top 100 jewelers. The allure of Rolex – and such other luxury brands as Cartier, Bulgari, Hublot, Chopard and Mikimoto – is just one of the reasons “to come out and enjoy the experience,” says Dikes, co-owner with his wife, Tracey, of the 4,000-square-foot showroom now in its 16th year. “We’re trying to break that barrier of, ‘Oh, it’s so far.’ It’s not anymore. Because of the I-595 expansion, I can make it from downtown Fort Lauderdale in 22 minutes. Dikes is happy to polish the other facets of that experience, such as the large selection at different price points, from custom designs to diamonds of up to 20 carats in stock direct from the cutter; an experienced staff, all with 20 or more years in the business; and a one-person-at-a time approach to customer service – not to mention the complimentary Friday evening champagne or Saturday morning Mimosas. And then there’s the trust factor, Dikes says. When you think “gown,” you’re probably not thinking “outlet store.” Zola Keller, Las Olas Boulevard’s bastion of luxurious formal wear, is trying to change that. The elite location with the statewide reputation is celebrating the first anniversary of its beachside sister store, where bridal gowns, evening wear and other high-end dresses sell at about a 60 percent markdown. Ranging from $50 bridesmaid dresses to $2,100 evening gowns, the average price for a dress at the Secret Closet is $300. “The response is good,” says Ave Keller, co-owner with his wife of 42 years, the stores’ eponymous fashion icon. “The name is very well-known. A lot of people are coming in through word-of-mouth, and because of that, we’re also getting a great supply of merchandise direct from manufacturers. So it’s working all around. Secret Closet racks hold over 3,000 items, most once available at the 40-year-old Las Olas store, including those sold back by customers. This month’s anniversary sale may make even those discounts seem modest, with price-tags of $150 on previously $3,000 gowns that were loaned for fashion shoots and shows, movies and charity events.